There is an elegance to a simple arrangement such as this. But to be appreciated even more is the double duty factor. Plates, bowls and vases are favorite accessories for me. They play well with others in groupings, can be utilized as table serving pieces or containers to display fruits or flowers and are economical and easy to find. Black and white works well with any color scheme. I found these little plates at one of my favorite local haunts and snatched them up immediately. The vase is from my pottery collection and the beautiful figurine was obtained from another area shop . For photo purposes, here the display sits on a solid shelf, but I often feature it in a hutch that has glass shelves and a mirrored back. 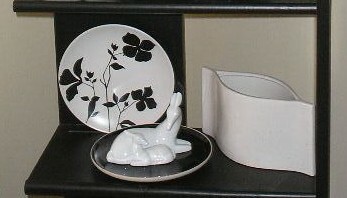 The black plate beneath accentuates the figurine, anchors the arrangement and on the glass shelf of the hutch, provides a bit of separation from a lower display. Have a great weekend and remember, don’t stress, just start. You’ve just read Double Duty Elegance by Cheryl Brindle. Consider leaving a comment (little cloud at top of article) or reply below! Click the EZ Display tab for more fun. Thanks for stopping by. Come back soon and bring your friends.